The Definitive Study on the #800deadBabies in Tuam and the Septic Tank! Apart from the Mail and coverage on “Liveline” (a popular phone-in programme) during which Catherine Corless mentioned her belief that the burial site was a sewage tank, the story was more-or-less ignored by Irish mainstream media, but rumbled away sensationally on social media. This led to it being picked up by international media outlets which, with few local news stories to check against, chose to cover social media speculation as if it were proven fact. In particular, most stated that “the bodies of 800 babies had been found,” which was not the case. Obviously, various international media players were left with egg on their faces and had to recant aspects of their original stories. There were at least some established facts, but sadly, these got rather lost in the scramble to recant. The established facts were that 796 deaths had been registered during the 36 years that the home was open; that this represented a mortality rate several times the national average, that no place of burial was known for most of these and that eyewitnesses reported that there were burials at the site, although the number could not be established. At this point, only two eyewitnesses were reported. Two young boys, Barry Sweeney and Frannie Hopkins, had lifted a slab on the site when playing there in the 1970’s. This exposed a pit “filled to the top with bones.” It was apparently assumed that the bones were those of “famine victims.” A priest was sent for, some prayers said and the grave was closed again. Sometime after that, a local couple began to tend the site as a memorial and it became the manicured site now familiar from media coverage http://bit.ly/1lQzroF But when these boys were playing there, it was an untended wilderness – the kind of place where only kids go. At around the same time as international media started to backpedal away from their initial sensational reports, another eyewitness account emerged, also from the 70’s, which appeared to contradict the first. An adult, Mary Moriarty, had seen a child playing with a skull and ventured into the brambly wilderness to try to return it to its resting place. She glimpsed a tomb and describes it here. This dismissal seems to be based on nothing more than a vague idea that we know what a septic tank looks like (and that there would be no “tunnel” to a septic tank.) But what if we don’t know what a septic tank (or, more correctly a sewage tank) looks like? What if it looks like this? 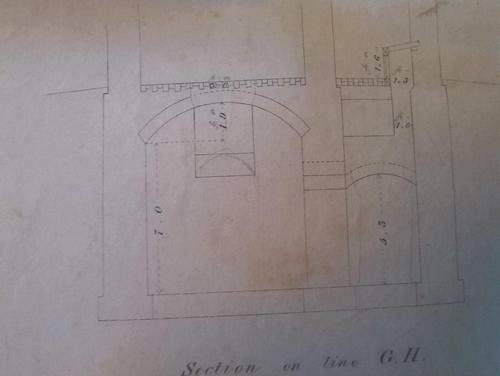 This is a “section” from the architectural plans of Tuam Workhouse, later the Mother and Baby Home. A section is a drawing showing a two-dimensional slice of a building or structure. Being two-dimensional, it doesn’t show the depth of the structure, just the height and width. This “cesspool” is 9’ 9” tall (just under 3 metres) and appears more than 3 metres wide. It has a high arched ceiling and looks much more how we might expect a vault or tomb to look than what it actually is – a sewage tank. The section comes from a document that, after a modest amount of research, I found in a public archive, where it seems nobody else had thought to look for it. I only had a mobile phone camera, so I couldn’t photograph the whole page, but here’s the corner that explains what the document is. 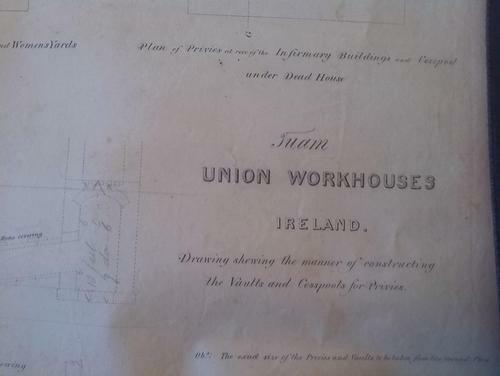 So, all the drawings on this page show structures that are part of the sewage system of Tuam Workhouse (“privies” are toilets – probably dry toilets, usually just a hole with a tank below.) They are extraordinarily varied in appearance and none of them would be immediately identified as a sewage tank by an inexperienced person. The sewage system is much more extensive than previously thought. So far as I’m aware, all previous accounts have relied on the idea that there was only one tank. 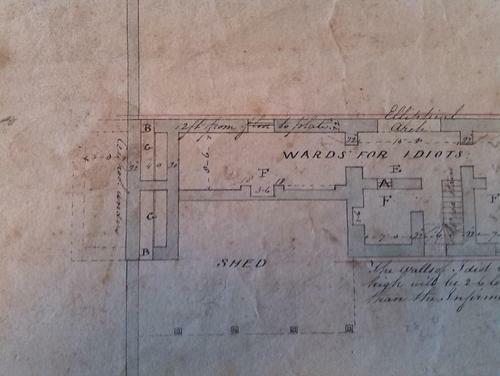 In the same archive, I also found a ground-floor plan. A “plan” gives a birds-eye view, like a map showing the shape of the buildings on the ground. 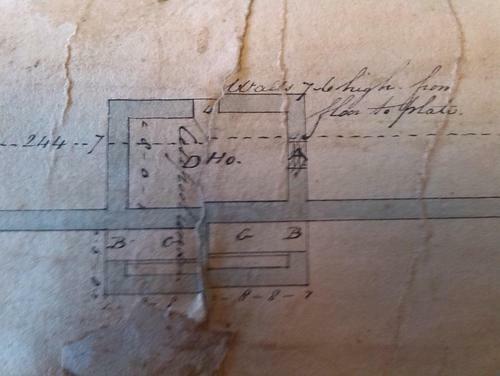 This plan was in terrible condition. It is very large, very faded and hard to photograph. This photo gives an idea of its general condition. 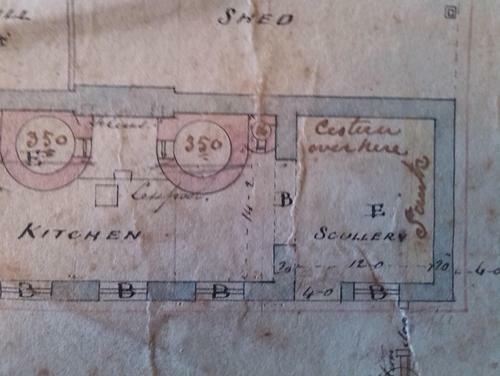 The positions of cesspools beneath the complex are shown on the plan. 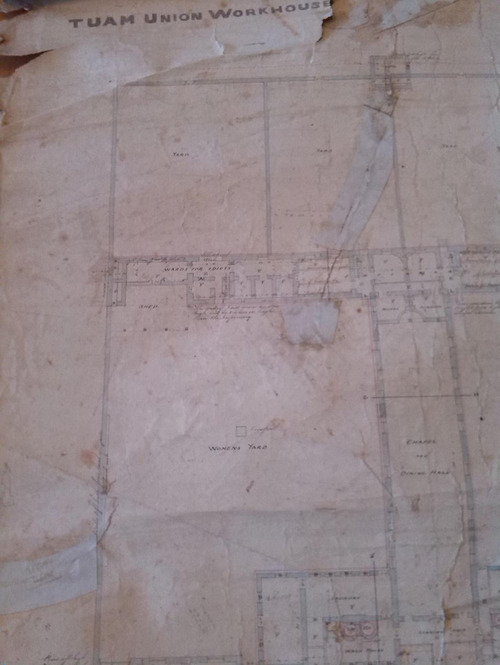 I counted nine, but there could be more -given its condition, the plan is hard to read. 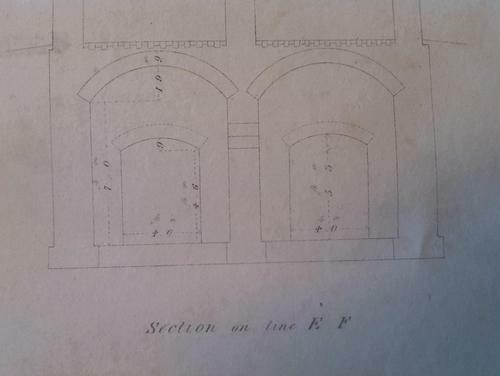 Structures are marked in the draftsman’s handwriting and much of the writing is tiny. 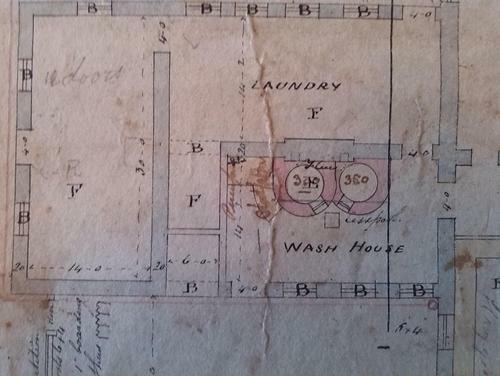 The Kitchen and Scullery are on the Women’s side of the complex, with the Laundry and Wash House occupying similar (but not identical) positions on the Men’s side. So that makes 7, right? That makes nine. As I said, there may be more – I almost lost my eyesight finding some of them! They are concentrated into the rear half of the complex, as the fancier buildings (Board Room, offices and the like) are up the front. So what does this prove? 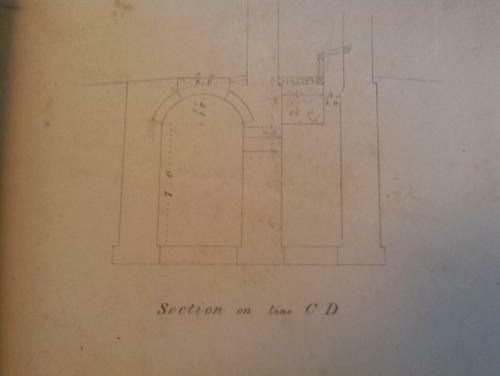 There was a range of underground structures under the Tuam Workhouse, which became St Mary’s Mother and Baby Home and these were associated with the containment and disposal of sewage. 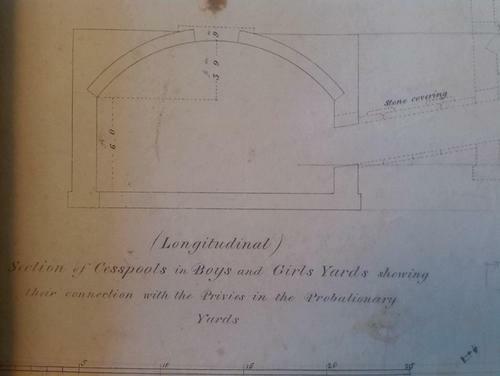 Shallow structures, covered with flagstones (like the slab lifted by the two boys) and higher, crypt-like structures (suggested by Mary Moriarty’s account) wereboth part of this sewage system. It doesn’t seem that this went ahead. 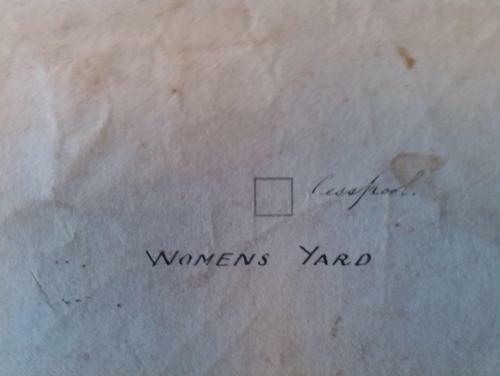 In 1918, a much more amateur-sounding scheme happened, using the labour of workhouse inmates under the supervision of the Master. Liam Hogan (@Limerick1914 on Twitter, who has done amazing work, tweeting a lot of press cuttings from the period) sent me this article from that year. 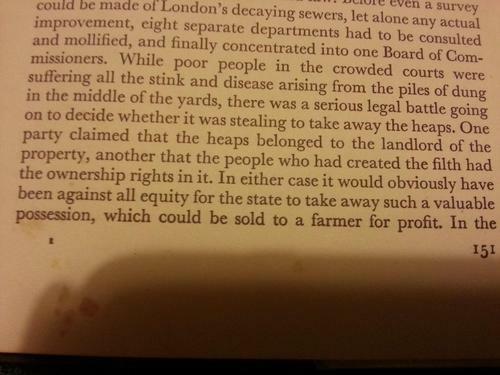 So these works could have made all or part of the Workhouse sewage system redundant, 7 years before the nuns moved in. On such a cramped site, it would be astonishing if a series of underground rooms had not found a use. As space to bury the dead appears to have been an issue, the sewage tanks may have become tombs. One final picture makes another point. 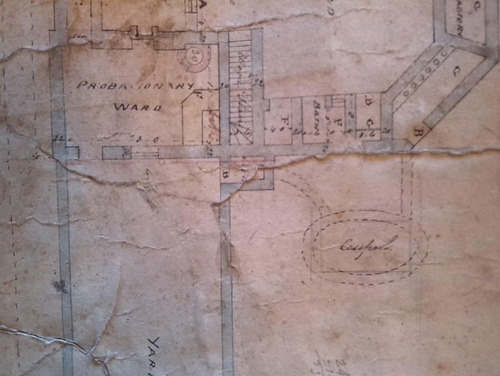 It has been reported that the Workhouse site has disappeared under a housing estate, leaving only the tiny scrap of land identified by Catherine Corless as a sewage tank (actually, this may be the 1918 tank, as it does not appear on the workhouse plans.) This is not true. As this animated gif shows, a large portion of the footprint of the site was not built on and a rather odd “blank space” was left in the middle of the housing estate. This space is now, of all things, a children’s playground and appears to occupy much of the area at the rear of the workhouse where, as I said, the sewage system was concentrated. It’s hard to look at this image and not speculate that somebody at Galway County Council in the 70’s didn’t want to dig up whatever they felt lay beneath the Mother and Baby Home. And this is a good place to end this story, for now. Church, State, communities and families all played their part in the massive tragedy of Ireland’s institutional past. When all the secrets are told, nobody is going to come out of it smelling of roses. It is very sad that we seem to be more interested in how these children were buried than in their miserable lives, or the pain still being experienced by the bereaved mothers and the adopted children severed from their histories. But as we are, I might as well come out and say it – it seems quite probable the #800deadbabies are buried in the sewage tanks. This piece is dedicated to my partner of many years, to the daughter she had “out of wedlock” and to the child that daughter is now carrying – no blood of mine, but in every imaginable way my longed-for grandchild. The documents mentioned were given to the Irish Mail on Sunday, which published them on 22nd June. Unfortunately this article has not yet appeared online. However, the Mail’s surveyors did confirm that these underground structures are consistent with anomalies found during their survey of a small part of the site.